Just 15 years ago we never would have dreamed that we could do so much without ever leaving the comfort of our own homes. Today the number of things and experiences that you can buy with just a few taps is mind-boggling. Here are just a few of the things that used to be you could only book in-person or over the phone. Before the age of Expedia, Kyak, Hotels.com, and even Airline Websites you had to call each provider individually, get the rates, write everything down, do a comparison, and then call back the winner. Or you had to go through a travel agent and who knows what kind of kick back they were getting and if you were really getting the lowest price. Today you can do it all yourself and customize everything just the way you like it. “Hello, and thank you for calling MovieFone….” Remember calling to find out when a movie was playing, realizing it started in 20 minutes, racing to the theatre only to find out that the show was sold out? Nowadays it’s as easy an app on your phone and you not only have all the movie times in one place but you can buy your tickets too.No more at-the-theatre frustration! Check out Fandango and good old MovieFone. Read our post on Why Consumers Prefer to Book Online. Imagine watching MTV and seeing an incredible new music video (Haha! First let’s imagine that MTV still shows music videos) that inspires you to buy the album. Not too long ago you’d have to find your way to a music store, but only when they were open.Record and CD stores still exist and, don’t get me wrong, I love them. But modern music is a digital endeavor which means that most folks are buying (or not buying) their music online. iTunes, Amazon, Spotify, and CDbaby make it easier than ever to buy music and have it delivered to your computer or MP3 player with just a touch of the finger leaving brick and mortar music stores charming relics of the past. Gone are the days of dialing and re-dialing and re-dialing the number for TicketMaster at midnight when your favorite band announces their tour or lining up in the cold and rain to buy tickets from the box office weeks and months before the concert you’re so stoked for. Today almost all ticket buying happens online at sites like Brown Paper Tickets, StubHub, and even the old standby, TicketMaster. Remember these cute ads? 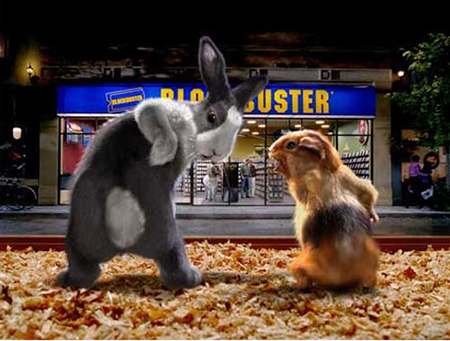 They couldn’t even help Blockbuster survive when home movie watchers heeded siren song of Netflix. Now, when you think of a new movie, you can watch it instantly on Netflix or AmazonPrimeor grab a DVD from Redbox while you’re filling up car at the gas station. Think of all that time you are saving, not to mention the the gas money and the late fees on late returns. What other things can you think of that have made the shift to almost entirely online booking? 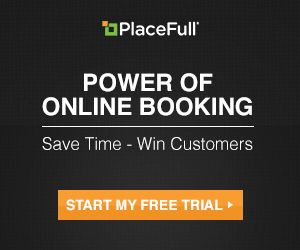 Come join the online booking revolution with PlaceFull! Categories: Booking Trends | Permalink. Of course the Internet has changed our lives in comfort as well as simple manner. However, the services that are available using online should be safe and secure and the online consumers are also be awaken while online transactions or using other online services. This post would guide the Internet users about the applications of online services and I’m thanking you for providing such an useful information in this post.